Austin Kleon: Showing Your Work is an Act of Generosity. 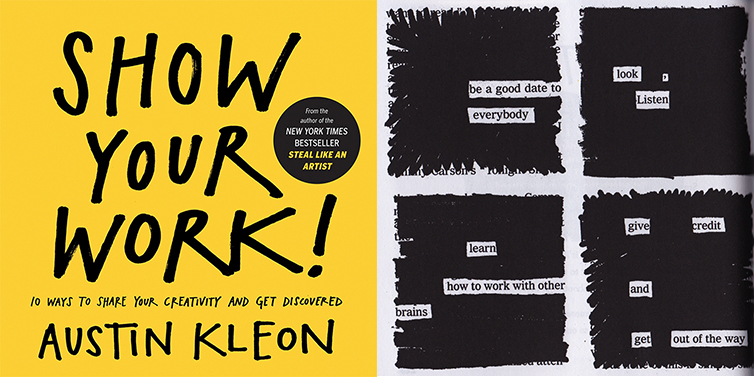 In 2012, artist and writer Austin Kleon gave us Steal Like an Artist. Now he brings us Show Your Work! : 10 Ways to Share Your Creativity and Get Discovered, described as “a book for people who hate the very idea of self-promotion.” He stopped by Seattle’s Town Hall on his book release tour and charmed us all with his frankness, humor, and humility. His sense of play and enthusiasm for life is contagious. He couldn’t resist playing the piano that happened to be in the room, and I couldn’t resist smiling. His book is for anybody doing any kind of work that they want to get noticed. Austin started the talk by quoting Christopher Hitchens about how publishing a book is like a free education. It brings you into contact with the people whose opinions you should have canvassed before you ever pressed pen to paper. They write to you. They telephone you. They come to your bookstore events and give you things to read that you should have read already… A free education that goes on for a lifetime. So, if you are thinking about writing a book, there’s another PRO to add to the list—free education, community, and a way to find your people. The very first chapter is titled “You Don’t Have to Be a Genius.” He speaks of the myth behind the lone geniuses we idolize. When in reality, the Mozarts, Einstiens, Mondrians of the world had a creative community supporting and inspiring their work. Scenius doesn’t take away from the achievements of those great individuals; it just acknowledges that good work isn’t created in a vacuum, and that creativity is always, in some sense, a collaboration, the result of a mind connected to other minds. Your primary focus should always be on the the work; focus on your business, your craft, your trade. If you share a little bit each day it makes it possible that your work might attract a group of people who share your interests. You will find your own scencius. All you have to do is show your work. Your website is your self-invention machine. Fill it with your work, and your ideas, the stuff you care about. And stick with it. The act of sharing is one of generosity—you’re putting something out there because you think it might be helpful or entertaining to someone on the other side of the screen. We’re all terrified of being revealed as amateurs, but in fact today it is the amateur—the enthusiast who pursues her work in the spirit of love (in French, the word means “lover”) regardless, of the potential for fame, money, or career—who often has the advantage over the professional. Because they have little to lose, amateurs are willing to try anything and share the results. Amateurs [are] just regular people who get obsessed by something and spend a ton of time thinking out loud about it. Forget about being an expert or a professional, and wear your amateurism (your heart, your love) on your sleeve. Share what you love, and the people who love the same things will find you. Teach what you know. What can you share that would be helpful to others? What questions are you constantly answering? What cringe-worthy mistakes do you see everyday? 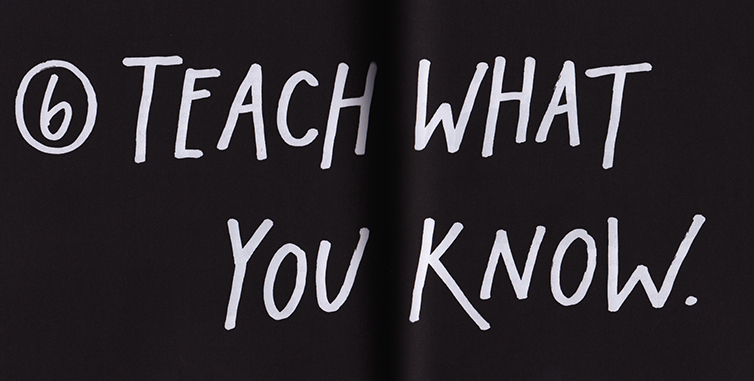 Why not teach people about what you know? Share your knowledge. Speak about your work, your process. Kleon says think process not product, and his Tumblr practices what Show Your Work! preaches. If you’re not telling the world about your work, who will? So many times I’ve thought: If the work is good, it will speak for itself. This is largely untrue. Our work does not speak for itself. How we speak about our work has a huge influence on how people understand and value our work. We all have experienced the devalue of our work. If you haven’t, you’re lucky. Recently, I received an email that said “Shouldn’t take more than 5 min, just need someone who has photoshop.” Not even someone who “knows” Photoshop, simply someone who “has” it on their computer. Yes, this message got under my skin, but it told be me that I have failed to speak about our design work in a way that helps people understand and value good design. I need to do better. No matter what we do, we are all educators. It is our job to educate people on what we do, how we do it, and why it matters. The rest of Show Your Work! goes on to consider; how reading obituaries can make you want to live; how to avoid being human spam; why we should always credit our sources; how a life of creativity is all about change; and why we should continually push ourselves to learn, even if that means we have to ask for help along the way. Thank you Austin Kleon for the re-minder to retain an amateur’s spirit and to embrace uncertainty. If you like this book you may also enjoy Steal Like and Artist, and his very first book with his blackout poetry titled Newspaper Blackout.